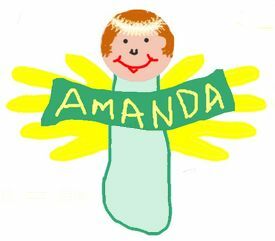 Here’s an easy angel art project for younger children, which uses both foot and hand prints to form an angel body and wings. This would be suitable as an art project for Sunday school, homeschoolers, or other youth groups at Christmas time. Trace around one of your feet (or have someone trace around your foot for you) to make the shape for the angel’s body. If you trace your foot on colored construction paper, you can now cut out the shape. If you trace around your foot on plain white paper, color inside the traced lines to make the angel’s body and then cut out the shape. You will also need to have someone trace around both your hands. It would be good to do this on yellow construction paper, but you could also color the hands yourself to make yellow angel wings. Cut out the hand shapes and glue them to the back of your foot shape, near the narrow heel part, as shown in our picture. Trace around a juice can lid or a tin can to make a circle for the angel’s face. Draw on a face and hair. Make the angel’s halo by cutting a little piece of sparkly chenille stem or glittery yarn to fit across the top of the angel’s head. Glue the halo in place. If you prefer, you could also draw on a halo with glitter glue. Lastly, cut another piece of paper in a scroll shape, or small rectangle, and write your name on it. Glue to the front of your angel.